The EV will hit the showroom in 2019. 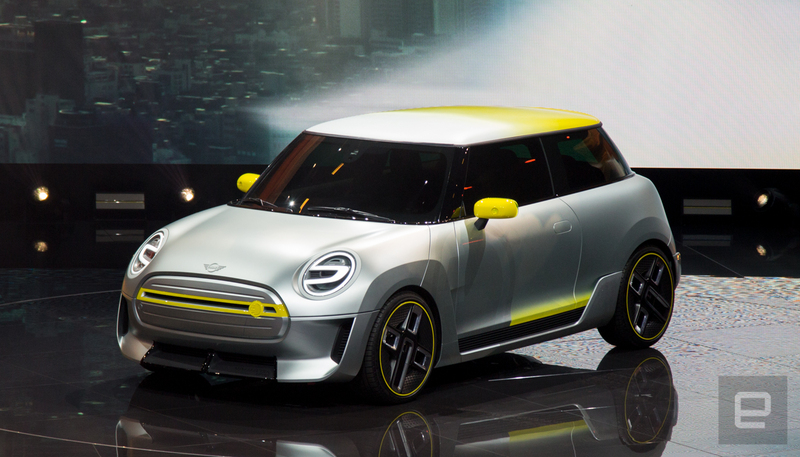 We've seen the fancy 3D renders; now here it is in real life: the Mini Electric Concept. Shown off on the first day of the Frankfurt auto show, the small EV is expected to hit production in 2019. With this and the recently launched Mini Countryman hybrid, the BMW subsidiary is pitching to drivers who want to be a bit more green but, well, also really like driving cars with go-kart characteristics. In classic Frankfurt Motor Show style, there's no word on the car's range, its specs or how much it'll cost. What we do know is that it'll be available in 2019. When it is available, it'll be the second electrified car from Mini. The automaker (like nearly every other company building cars) is betting big on electrons. "Our top priority is electric mobility," said BMW CEO Harald Krueger. At the Frankfurt show, he said that BMW is planning to have 25 electrified cars (12 of them fully electric) by the year 2025. One of the ways the automaker plans to do that is using a platform for each vehicle type that accepts a gas engine, hybrid or pure EV drivetrain. But while we wait for that to happen in 2020, the company has the iPerformance line, the i Series and both hybrid and electric Minis to keep us moving around.